What you will get with this product: 2 Minis™, 2 Wedges and 1 Drawstring Nylon Bag. two Lean™ with 10 and one Lean™ with 5. Order one set of Mini’s and receive one Lean™!!! 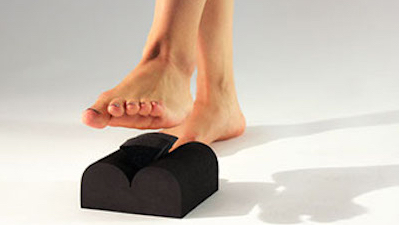 MINIS™ by Parasetter® are two small and lightweight platforms (5’ x 5” x 2.5”) made for foot stretches and to treat foot pain. Each one weighs only an ounce, but can support an adult body. Made of a special “space age” type material, the MINIS™ feel resilient and yet firm. A curved Wedge is designed to fit into the Center Channel. MINIS™ can also be used as a plantar fasciitis treatment to relieve foot and heel pain. A series of six foot exercises Stretch, Strengthen, Activate and Align all the bones and muscles and tendons in the feet so that your over-worked and often pained feet are rejuvenated. Everyone needs healthy and happy feet to support, move and balance our bodies. Place the balls of the feet on the MINIS™ so the toes relax into the Center Channel. Feel the upper calf lengthen as you stand with knees straight. After a few seconds, soften the knees to release the upper calf muscles. Repeat for a minute daily and avoid low back and heel pain (plantar fascitis). Place the backs of heels at Center Channel and forefoot on the floor. Try to “dome” the arch. Imagine your heels sliding towards your toes. This move will strengthen the toe flexors and foot intrinsics. With heels on MINIS™ and forefoot on floor, lift the toes first and then lift the rest of the forefoot. This wakes up the tendons that cross your ankles. Repeat quickly and the muscles of the ankle and shin will activate. Turn MINIS™ so Center Channel faces the body. Insert the Wedge into Channel slightly behind the midpoint. Stand tall on Wedge so the ankle aligns with the front of the Wedge. You will experience a realignment as the proprioceptors turn on. Place both Wedges in one MINI™ to support all the arches of the foot. Repeat the previous exercise with one foot to increase the intensity and challenge. Your body will vibrate. In this position, you can access the true Plumb Line that runs through the body! Turn MINIS™ over so flat side is on top. Stand and practice balancing. Touch a wall or chair for support. Gradually raise arms to shoulder level and attempt to balance. Just standing on these MINIS™ you experience micro movements throughout your body as it naturally finds a balance and center. Better posture and more graceful movement. But the best part is that the six exercises are easy to do and feel so good—Almost like getting a foot massage. When you step off the MINIS you feel lighter and more buoyant immediately.